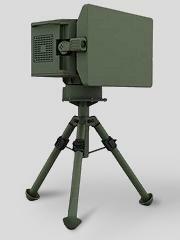 ACAR is a KU-Band Low Probability of Intercept (LPI) 2D ground surveillance radar of the Turkish manufacturer Aselsan. It uses a slotted waveguide array antenna. ACAR detects, tracks and classifies moving targets on the ground or on the sea, as well as low flying airborne targets. ACAR is also used for artillery fire adjustment, providing feedback on the fall of shot with respect to the intended target. The compact and lightweight ACAR system built on solid-state design, employs a versatile interface that allows for convenient integration on vehicles and elevated masts or towers. The radar may also be operated as a stand-alone system on its tripod. ACAR also supports interfaces for integration with Command & Control Systems, and stands out as an ideal system for border/perimeter surveillance. ACAR is the third generation member of ASELSAN’s family of surveillance radars. ASELSAN’s heritage in surveillance radars exceeds 20 years, during which hundreds of radars have been delivered to both the Turkish Armed Forces and international customers. The advanced features and man-machine interface design implemented in ACAR have been inspired substantially by the feedback of operators who have used these radars on the field.